I was in New York for Thanksgiving a couple of years ago, and wanted to find a restaurant where I can eat a traditional Thanksgiving meal. After doing a bit of research, I decided to have dinner at a French restaurant. It's called Petit Poulet (Little Chicken). It might seem odd to have dinner at a French restaurant for Thanksgiving , but really I don’t regret it. Dinner was excellent, this place is highly recommended. ├ How is the Petit Poulet? ├ How is the atmosphere of the restaurant? ├ What is the clientele at Petit Poulet? ├ What is a good tip for Petit Poulet? ├ Where is the Petit Poulet in New York? How is the Petit Poulet? 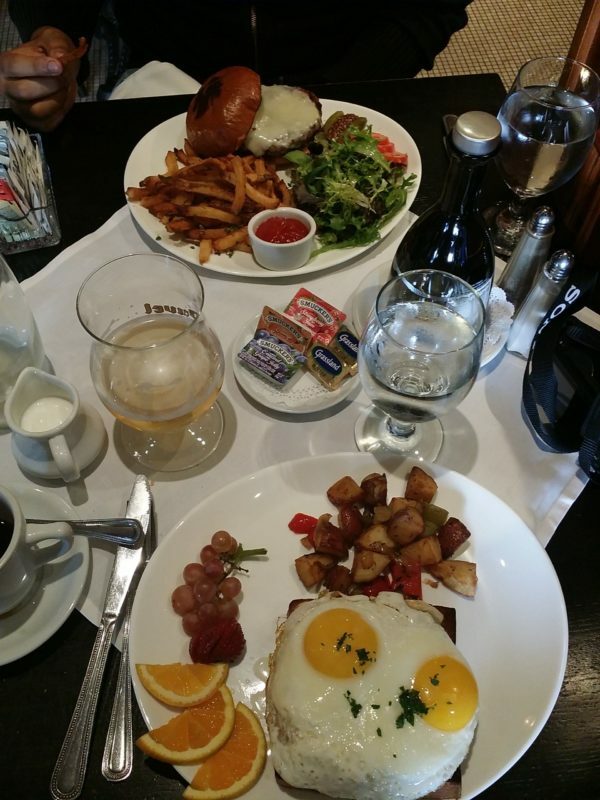 Petit Poulet is located near Herald Square. It is on the ground floor of the Radisson Martinique, but it has its own front entrance from the street. The hotel is a historic landmark in New York, however, the hotel opened recently in 2012. This restaurant seems to be a Parisian bistro. It is not very large but it’s beautifully decorated. The walls are made out of wood elements, and the roof is a metal stamping. Some tables have chairs or benches, and they have a bar you can sit at facing the kitchen, while watching the chefs working. How is the atmosphere of the restaurant? It is a very nice restaurant, the music is not very loud, and it’s a pretty quiet place. What is the clientele at Petit Poulet? The wines are from France, but they also have California wines. The entree was simple (vegetables or salad), I could not pass on the turkey 😀 The cooking was perfect, the turkey was delicious, with gravy (prepared as thick based turkey gravy), cranberry chutney, sweet potatoes and beans. For dessert, we had the famous Pumpkin Pie. It is a very rich, also homemade cake. What is a good tip for Petit Poulet? A real good tip is to go to this restaurant for Thanksgiving dinner. They had a great menu at a great price. I've been told that the Christmas dinner is also very tasty! Where is the Petit Poulet in New York? The restaurant is located in Korea Town, between the Empire State Building and Greeley Square. Petit Poulet is a very good restaurant in the Parisian bistro style in the heart of New York. Thanksgiving dinner was delicious. Highly recommended for special occasions, a lunch or a romantic dinner.